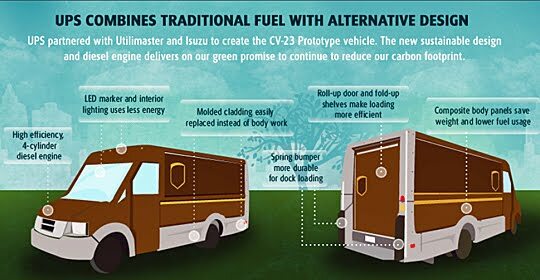 UPS plans to launch a composite plastic truck that's 500 kg lighter than a standard one, gets 40 percent better fuel economy and helps save 84 million gallons of fuel annually? Through December of this year, the company is testing five new prototype trucks. The CV-23 is the product of Utilimaster and Isuzu. During an eight-month testing period, the new trucks will get heavy usage on some of UPS's most punishing routes, in Lincoln, Nebraska; Albany, New York, and Tucson, Arizona. UPS replaces 5,000 to 6,000 vehicles each year, as part of a constant process to maintain and update its worldwide fleet of 70,000-plus vehicles. 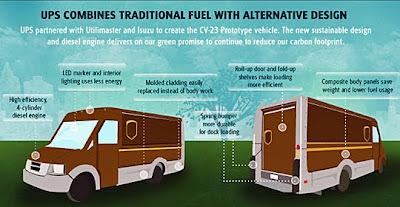 While the CV-23 doesn't run an EV or Hybrid powertrain at the moment, UPS have been fairly active in testing both fully electric and innovative hybrid systems so we look forward to the company combining EV and plastic for even greater energy savings.